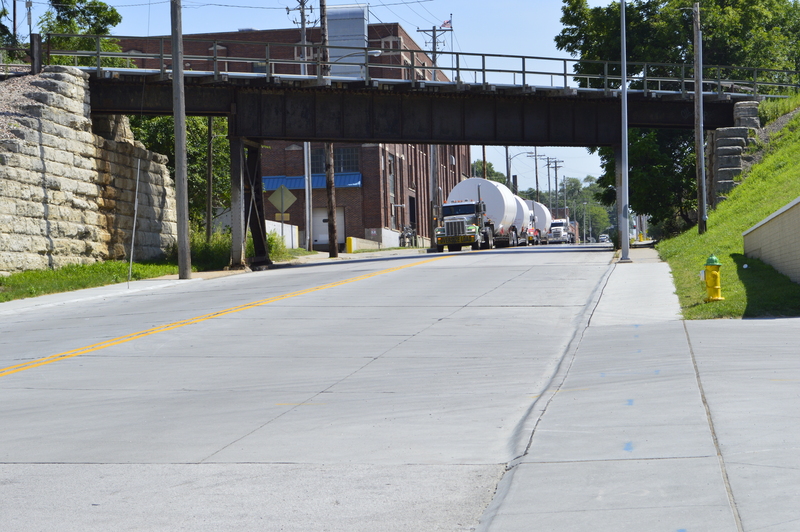 Under a clear blue July sky in Omaha, NE semi-trailers with oversized loads lined the street near the Nox-Crete corporate headquarters. 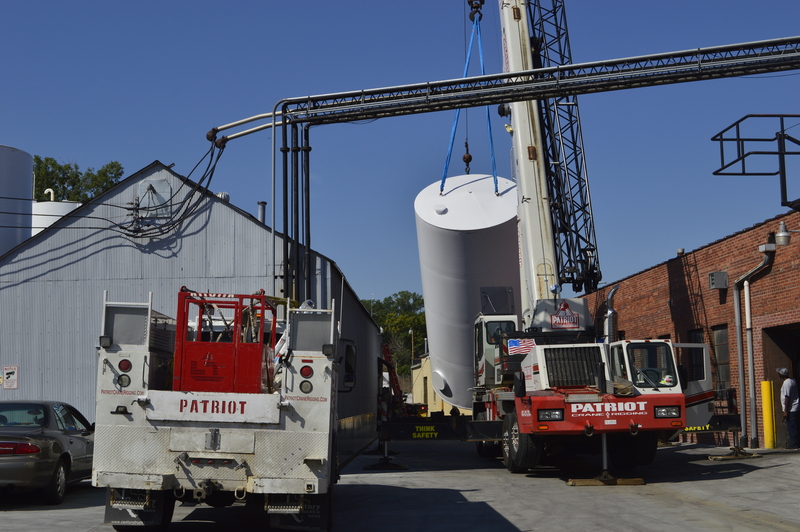 Each carried a key element in new efficiencies coming to the Nox-Crete plant; four 20,000 gallon storage tanks in all. 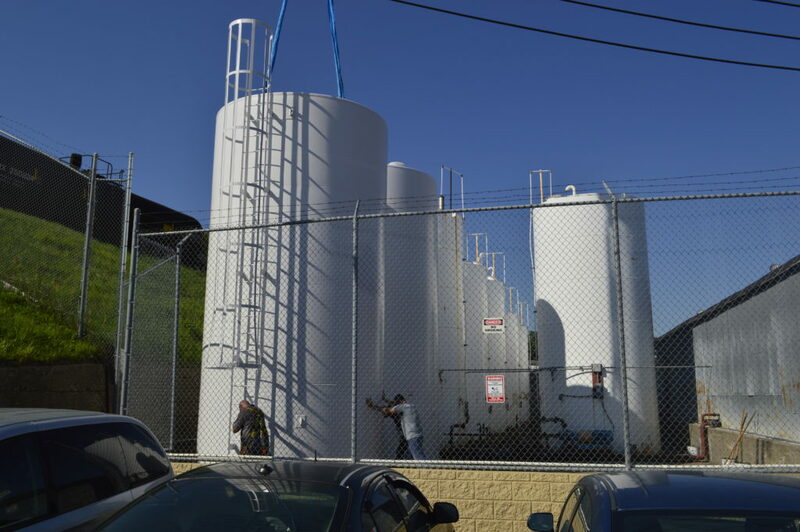 Throughout the afternoon, a crane carefully lowered these tanks into place with Nox-Crete operations team members keeping close supervision. Trucks lining the street, ready to deliver the new storage tanks. 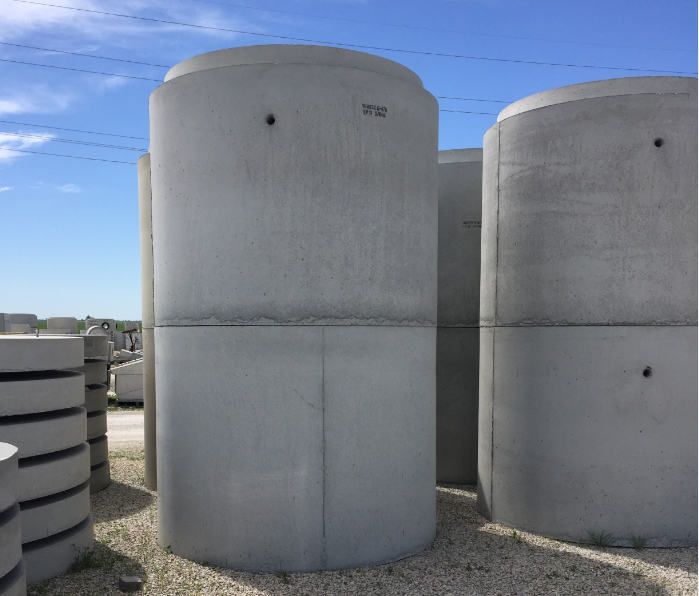 Additional upgrades include an updated tank level monitoring system and new processing equipment that will help to achieve higher quality products and materials savings for the forming and tilt-up market segments. This tank is about to go up and over! 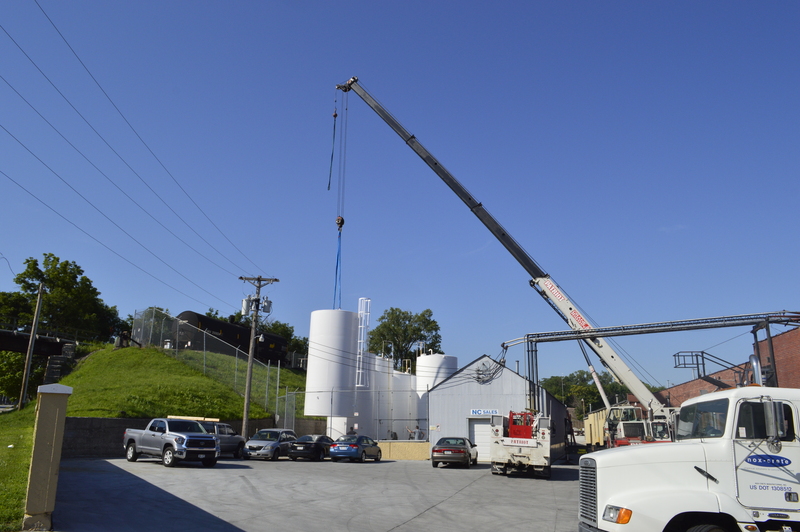 The team adjusts the tank to its final resting spot before the crane releases it. Expanded capabilities in the plant are a great step forward but the growth doesn’t end there. 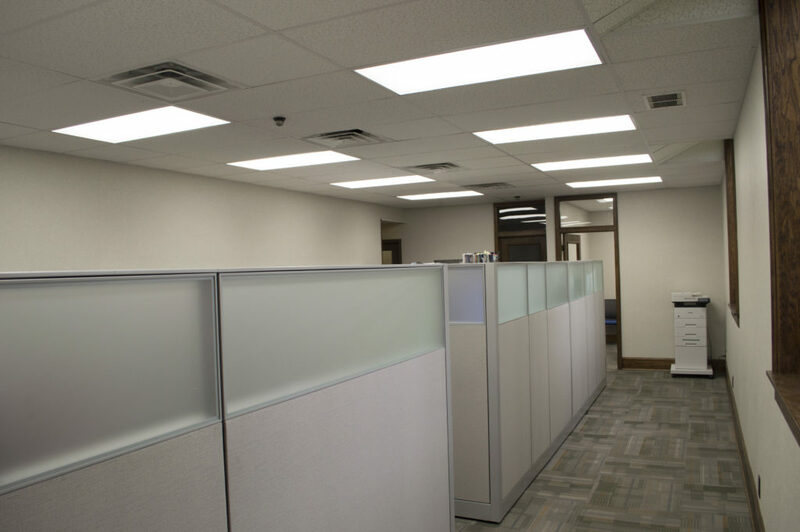 In order to facilitate the addition of new team members and allow for reorganization of people by function, it was necessary to renovate and repurpose an existing space within the office. Refurbishing the existing space means saying good-bye to decades-old decor that is out of sync with the more modern areas. Where 3 carpet-walled cubicles used to live, 6 sleek, modern cubicles now reside. 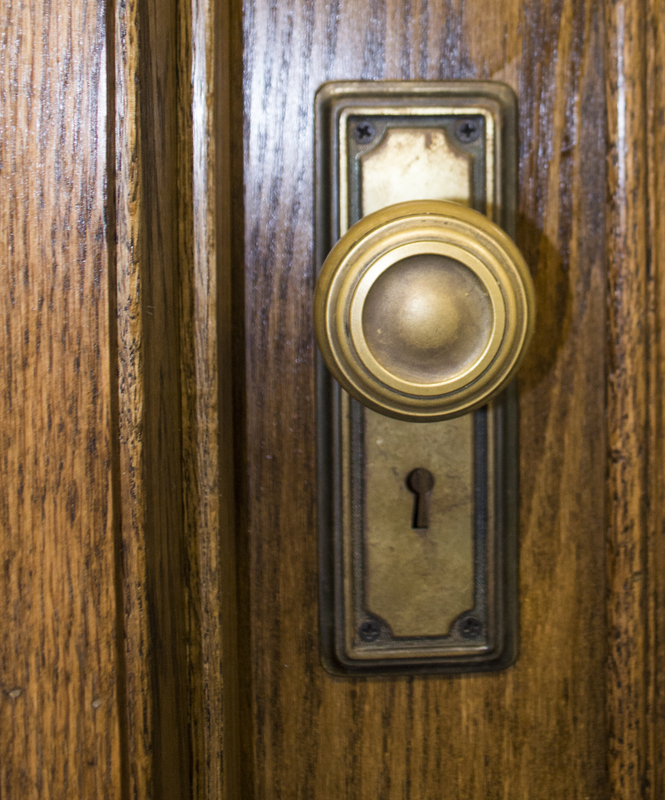 Right down to the door knobs, extra steps were taken to make the new offices match the originals. Contractors renovating this new office space were careful to maintain the integrity of the historic building. The new glass panel doors with overhead windows are indistinguishable from those on the original offices in the building. 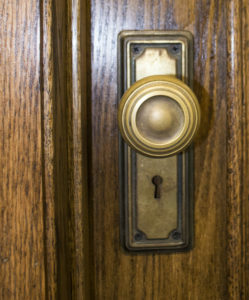 The contractor even scoured local rummage shops to find doorknobs that matched the others in the building. Everything is in place to increase storage and accommodate more team members. That puts Nox-Crete in a great position to continue providing superior products and excellent service. This entry was posted in Feature, Nox-Crete Blog, Uncategorized on July 27, 2018 by Andrea Kemp. 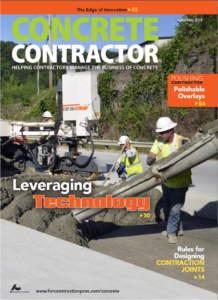 See our new Article on Organic Acid Concrete Removers in Concrete Contractor Magazine! 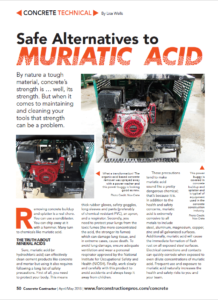 Inform yourself of the dangers of working with muriatic acid and learn about the benefits of removing concrete buildup with an organic acid based product in Lisa Wells' article, "Safe Alternatives to Muriatic Acid" in the April/May 2018 issue of Concrete Contractor magazine. Read the full article here on page 50! 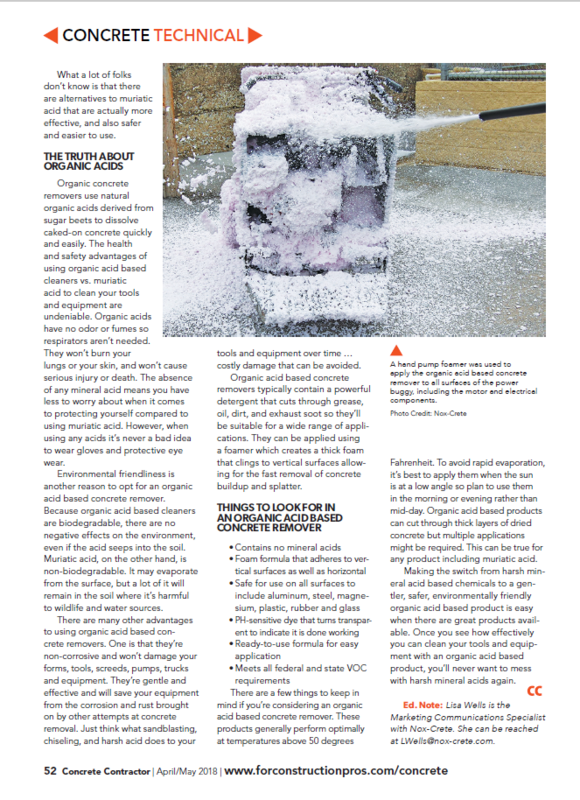 Anyone in the concrete industry knows how difficult removing built-up concrete on tools and equipment can be. Many turn to muriatic acid to do the cleaning but this chemical is dangerous to those using it and anyone close enough to inhale its fumes. It's also highly corrosive and will damage many of your tools. 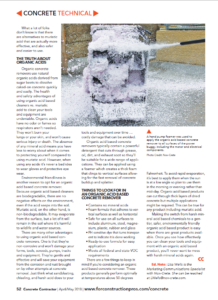 There are safer, organic-acid based alternatives that actually do a better job. Blast-Off, for example, is made from sugar beets and it turns caked-on concrete to mush that easily washes away. And Blast-Off is safe to use on all surfaces, even rubber, glass, metal, and electrical components. 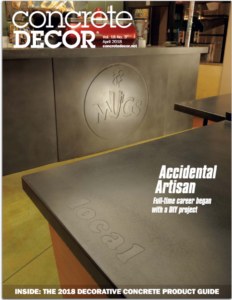 This entry was posted in Feature, Specialty Chemicals, Uncategorized on May 2, 2018 by Andrea Kemp. 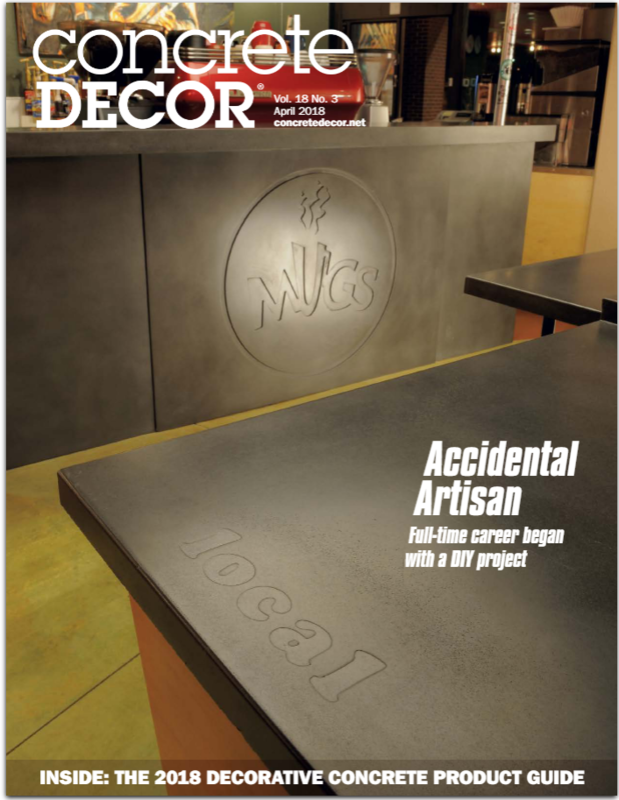 See Craig Coppersmith’s new Article in Concrete Decor Magazine! 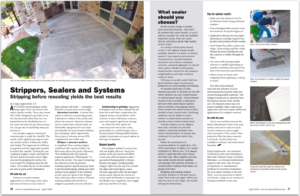 Learn about removing old acrylic sealer with acrylic stripper blanket systems, look for Craig Coppersmith's article, "Strippers, Sealers and Systems" in the April 2018 Issue of Concrete Decor magazine. Right now, much of the country is experiencing a never-ending winter. But the days are getting longer and the temperatures will (eventually) rise. It won't be long before you're spending more time outdoors. 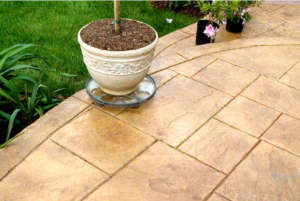 Does your patio need some freshening up? It may be time to think about removing old acrylic sealer, especially if it's been several years since its application. 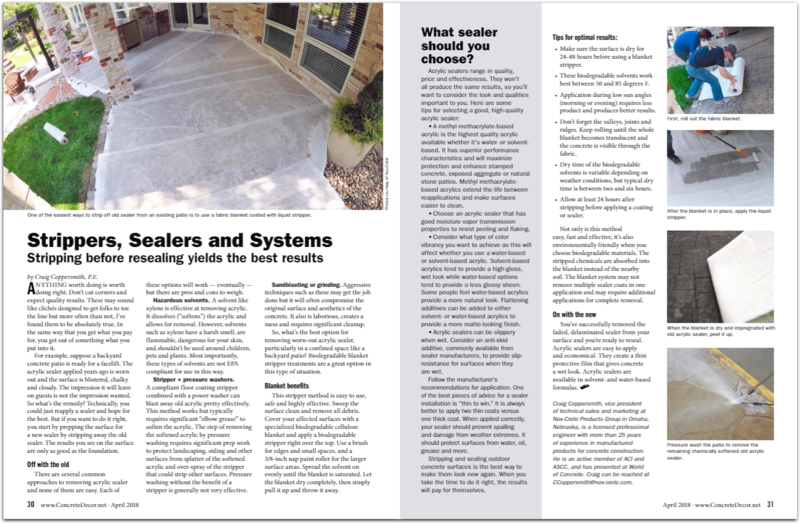 Acrylic sealers will appear blistered, chalky and cloudy after several years, but stripping them can be messy, laborious, and even hazardous depending on the method you use. 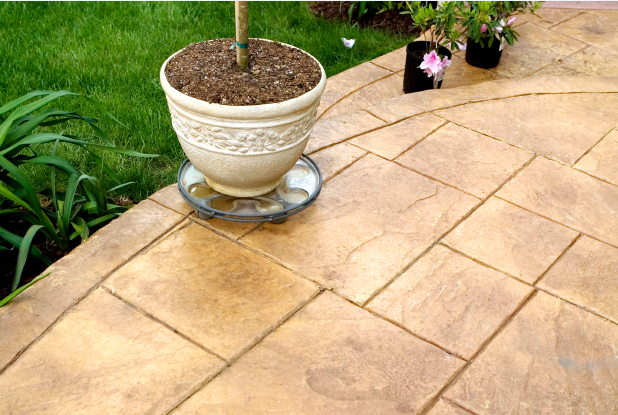 A blanket stripper method makes removing the acrylic sealer from your patio easy, clean and effective. In just 3 steps, you can remove the old, worn-out acrylic sealer and be ready to reapply a fresh coat. Our very own Deco-Peel blanket system is an easy-to-use, highly effective stripper for acrylic sealers. This entry was posted in Feature, Uncategorized on April 19, 2018 by Andrea Kemp. 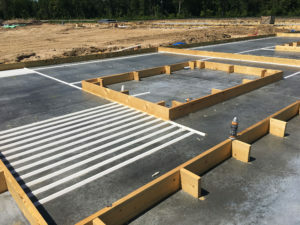 For a more in-depth explanation of biodegradability classifications as well as the differences between petroleum-based and water-based form release agents, see Patrick Linn's article, "Understanding Biodegradable Form Release Agents" in the April issue of Concrete Products magazine. Simply put, biodegradability refers to a product's ability to naturally break down to its raw material state. The quicker it can do so, the more biodegradable it is. Organizations like the Federal Trade Commission (FTC) and the U.S. Environmental Protection Agency (EPA) apply regulations and standards on how to classify products as biodegradable. For example, the FTC requires proof that the "entire product [...] will completely break down and return to nature within one year". In other words, marketers can't just say an item is biodegradable; they must prove it to be. Biodegradability is divided into two classes: readily biodegradable and inherently biodegradable. Both have the the ability to biodegrade to their natural state when exposed to water, sunlight and microbial activity. However, they do so at different speeds. Readily biodegradable products achieve 60-100% break down in 28 days or less while inherently biodegradable products break down at 20-60% in 28 days. You can find biodegradable release agent options in water-based formulations such as Bio-Nox and petroleum-based formulations. 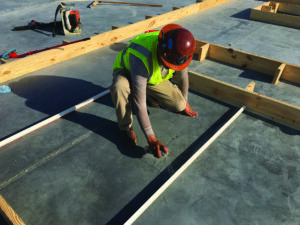 Water-based form release agents are suitable for most form surfaces and are safe in enclosed building sites. They are typically inherently biodegradable but not always readily biodegradable. Petroleum-based form release agents are also suitable on many surfaces and are usable in all weather conditions. Most can be considered inherently biodegradable, but not all are. Some, which incorporate vegetable oil into the formulation, such as Bio-Nox VS, are actually readily biodegradable. 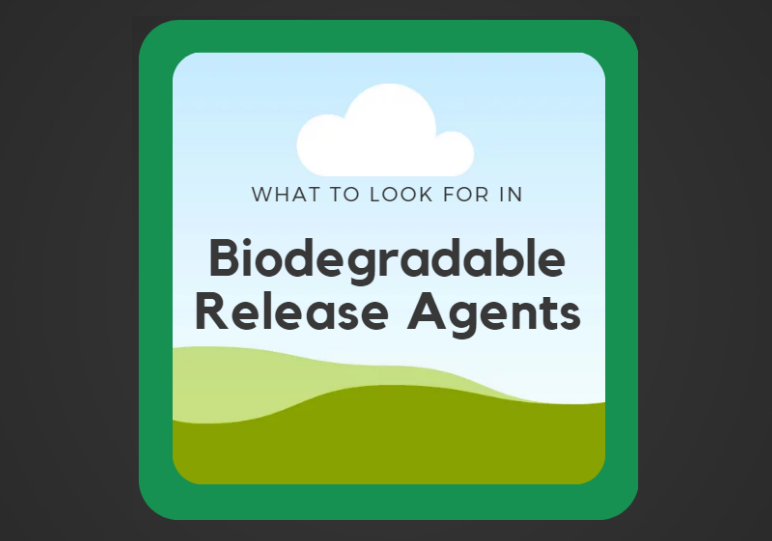 A commitment to using a biodegradable form release agent will require you to pay close attention to the manufacturer's information and do your research. You can find eco-friendly options that offer exceptional results. This entry was posted in Feature, Uncategorized on April 6, 2018 by Andrea Kemp. We’re proud to share with you that our PVC rustication strip product, Clean Line Reveal, is the Industry Choice winner in the Concrete Construction Equipment category in Hanley Wood’s 2018 Most Innovative Products. 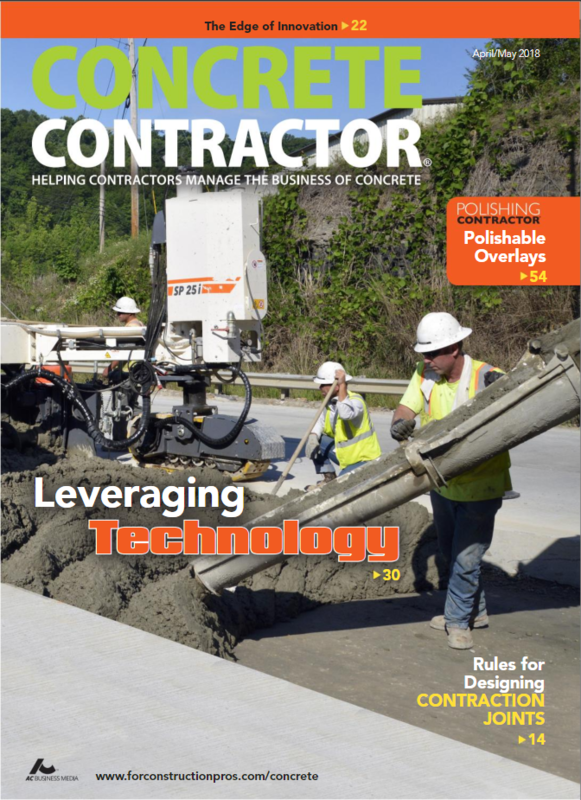 This award is presented annually in conjunction with the World of Concrete. Attendees of the tradeshow and audiences of Concrete Construction and The Concrete Producer vote on products they deem to be innovative to the industry. 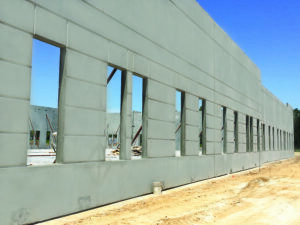 A panel of industry experts, many of whom serve on the World of Concrete Educational Advisory Board, also have a hand in selecting the winners. Clean Line Reveal (or CLR) is available in a variety of profiles to create design details in tilt-up and precast structures like never before. The extruded high density PVC material makes the strips lightweight and durable, and unlike wood, they’re oblivious to climate change. CLR is easy to install, easy to remove, and produces a clean, uniform finish that’s incredibly smooth. Wood reveals contain sugars that can leach from the wood, resulting in discoloration and retardation; CLR eliminates this concern. Additionally, there is a reduction in labor costs because this product eliminates the need for priming, sanding, and repairs. Plus, it's easy to cut pieces in the field with a circular/miter saw. Secure Clean Line Reveal strips in place with an adhesive spray. We consider it an honor to have Clean Line Reveal win the Industry Choice MIP. Winning this category in particular serves as a testament to the quality of this product. We congratulate all of the other nominees and winners of their respective categories and we look forward to the innovative products and ideas the industry will see next year. 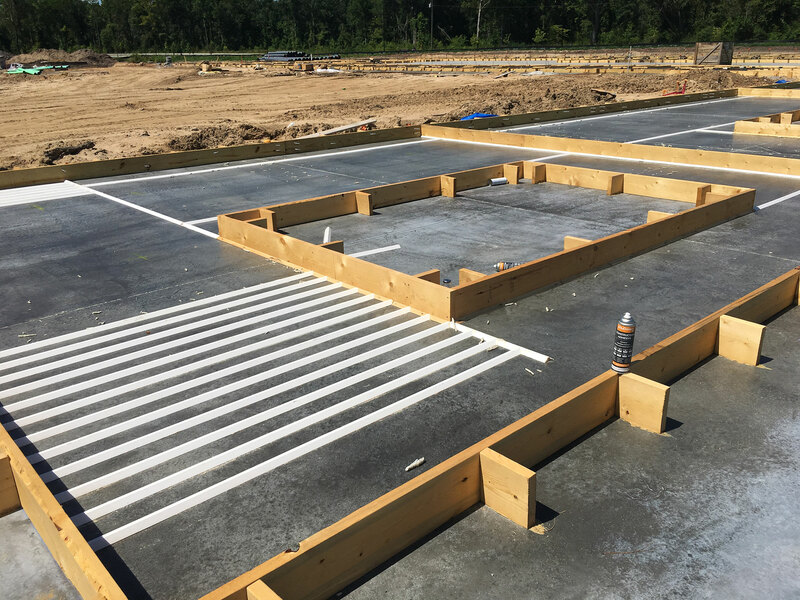 This entry was posted in Feature, Nox-Crete Blog, Precast, Tilt-Up on March 12, 2018 by Andrea Kemp.